Kardzhali is a mostly agricultural region. The hills and the river valleys of the Arda, Varbitsa, Krumovitsa and Byala Reka Rivers make it a beautiful region, but its resources haven’t really been a great source of economy for its inhabitants. Tobacco is largely grown here. Kardzhali was once the grounds of the sacred and ancient Thracian city of Perpericon. Other sites are the medieval fortresses near Kardzhali, Perperek, Efrem, Vishegrad, Ustra, and Tatul, memorials to the time when the area was a stronghold of Orthodox Christianity. 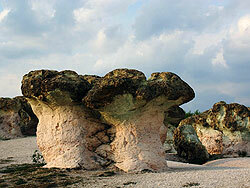 The oddly-shaped rock formations near the village of Zimzelen have been carved by nature over thousands of years, and the forces of volcanic activity and weathering built up a forest of the curiously shaped Stone Mushrooms around the village of Beli Plast. Not far away is another collection of rocks—the Stone Wedding Party, consisting of pink, red, yellow and white rocks. Nature reserves have preserved the ancient forests populated by the dense and dramatic foliage of European black pine and evergreen Thracian oak trees. Although there really isn’t much to do in the region beyond exploring its natural wonders, people here indulge in aquatic sports in the artificial lakes of Kardzhali and Studen Kladenets, on the Arda River. The town of Kardzhali is the region’s administrative centre. It is probably the most important city in the Eastern Rhodopes, attracting investments, companies and tourism to the region. There are several hotels and shopping areas in the town centre. Kardzhali’s economy depends mainly on the tobacco, metallurgy, machinery, food processing and tourism industries. The weather is usually mild and sunny, and Kardzhali’s two dams have been stocked with carp and perch—perfect for fishing. Being close to their borders, Kardzhali gets a lot of visitors from Greece and Turkey.